Peamount United striker, Amber Barrett. PEAMOUNT UNITED EXTENDED their winning start to the season to four games after their 7-0 win over strugglers Kilkenny United this afternoon. 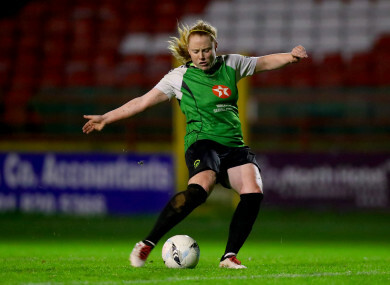 Returning Ireland international Amber Barrett netted twice for Peamount as James O’Callaghan’s side returned to the top of the Women’s National League table. In difficult conditions in Thomastown, the visitors raced into a four-goal lead at half time - Lauren O’Callaghan among the scorers in the opening 45 minutes. After the restart, Louise Masterson, Megan Smyth and striker Barrett rounded off the scoring to cap a comfortable win. They now prepare to take on title rivals Shelbourne next Saturday. Another Ireland international lit up proceedings at Markets Field this afternoon as Rianna Jarrett notched a first-half hat-trick to send Wexford Youths second in the table with a 6-1 victory over Limerick. The defending champions raced into a 5-0 half-time lead, with captain Kylie Murphy opening the scoring after just three minutes of play. Katrina Parrock doubled the visitors’ advantage just six minutes later before Jarrett scored her first of the afternoon. Another two goals in quick succession from the Ireland striker gave the visitors a five-goal advantage at the break. Vanessa Ogbonna scored Youths’ sixth and final goal of the afternoon before Sylvia Gee pulled one back Limerick. Email “Peamount maintain perfect start with resounding win over strugglers Kilkenny”. Feedback on “Peamount maintain perfect start with resounding win over strugglers Kilkenny”.